Modern ecological technologies like solar energy collectors or wood stoves are conceived in such a way that they only work with electricity, and can only be serviced by experts. But the DIY construction of simple solar energy plants that works without electricity could be popular knowledge, like the DIY construction of good wood stoves is still commonplace in some parts of Russia. Many things that are destroyed here as junk, or burnt into poison, were not necessary to produce in the first place, or can be directly turned into more useful things by hand, without a melting furnace or smokestack. In countries, where people cannot be wasteful to the detriment of others, this is quite normal. low-energy stoves out of trash, wood, bricks from demolished buildings, and clay. Even though I reveal the special aesthetics of old materials, my real art is to use found trash and natural materials in as simple a way as possible for technologies that remain easy to understand, make us more independent, and help us. In the construction of simple everyday objects, I can directly integrate the beauty of nature’s gifts into the design, and develop especially practical solutions. A bench made of crotches is much more robust than one made of wooden slats. And I can experience the cycle of things from nature back to nature. Things I have built myself, I can also repair myself—traces of their use, holes, and colourful patches tell their history— or make something new out of what is left over. 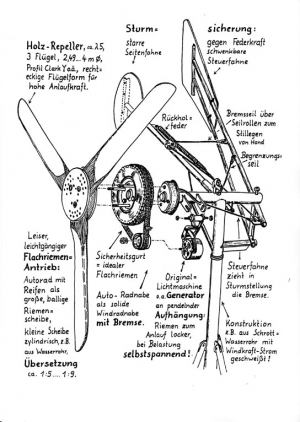 I have been passing on the joy of building things oneself, and instructions on alternative technologies (the result of many years of experience) since 1983 in my series Einfälle statt Abfälle (Ideas Instead of Trash), with texts and drawings by me.